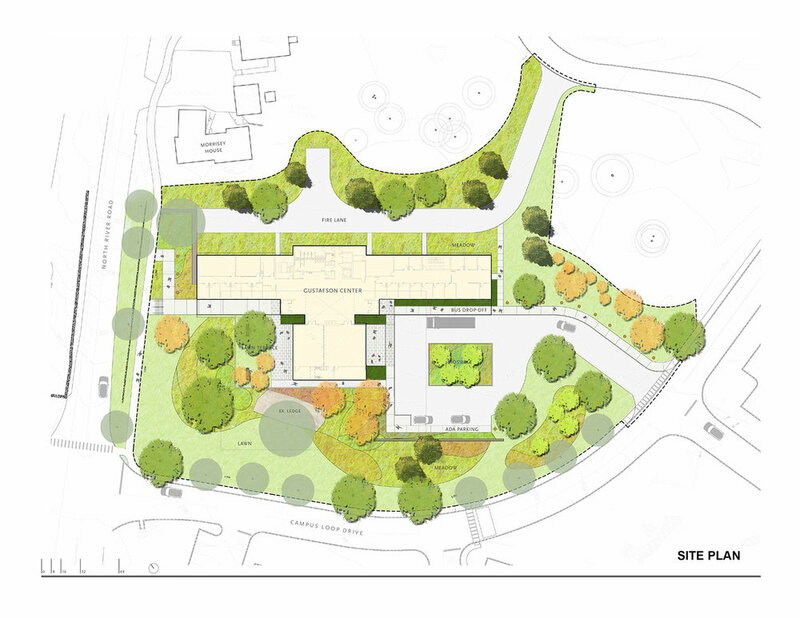 Our architecture firm was selected for the design and construction of a new Welcome Center to be sited at the primary entrance to a 300-acre rural campus in central New Hampshire. 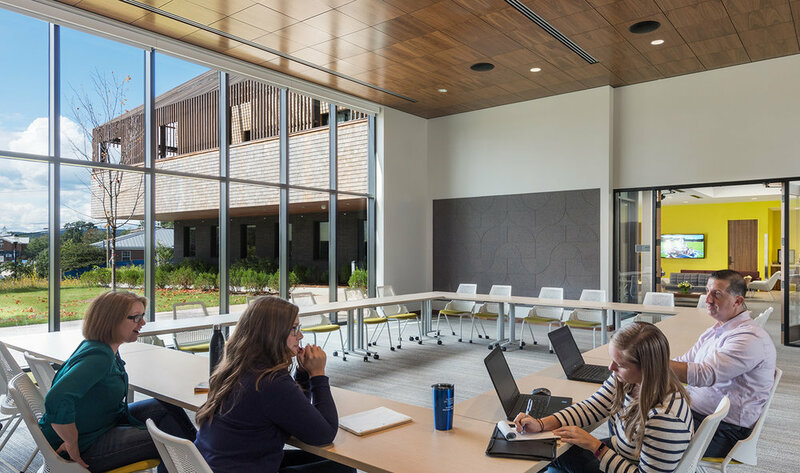 The $8.9 M, 23,000sf new building, completed in December 2016, incorporates current user-groups with shared programmatic synergies previously dispersed throughout the campus into a single, consolidated location. The program was developed with the University in parallel with site selection, building size and a detailed conceptual budget. The Gustafson Center is considered one of the most important facility additions to the campus. The overarching goal of the project, defined by the University, aims at creating a signature building that serves as the “front face” of the University, immediately communicating the University’s supportive experience to visitors arriving on campus. Programmatically, the building serves the University’s Admissions, Career Development and Institutional Advancement departments. These functions were previously located in separate, aged facilities that no longer met the current needs and expectations of twenty-first century students and University staff. By collocating these user-groups under one roof, the new Gustafson Center design strives to exploit these programmatic adjacencies by being the first place to greet prospective students and visitors upon arrival to campus as well as providing the last opportunity to connect with enrolled students in support of future careers before they leave the University at graduation. The double height, naturally lit central core and group rooms of the building enable comingling of these polar opposite constituencies and provide a comforting environment for happenstance encounters. Architecturally a modern interpretation in form and massing of the barns of the region, the wood shingle and brick building sited in a reestablished natural landscape aspires to be warm and inviting, playing a pivotal role in prospective students’ and parents’ first impressions of the University. The intent is to allow the cedar shingles and the IPE wood to weather over time to gray, allowing the material palette to be at once contextually “New England” yet contemporarily “new.” The second floor massing of the barn volume pulls back from the perimeter at the southwest, creating an outdoor space for small group gatherings or individually contemplating the landscape beyond. 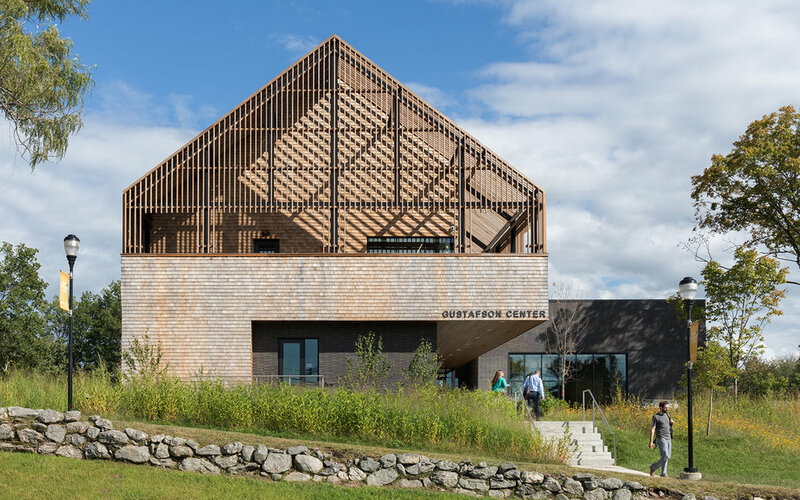 At the same time the solid pitched roof overhead disintegrates to a slatted canopy, reinforcing the volume of the building yet creating a dynamic sunlight environment that dramatically changes throughout the day and the seasons.